Cholesterol is essential for the viability of mammalian cells and accordingly, the amount of cholesterol in cell membranes is tightly controlled via vesicular and non-vesicular transport. Small variations in cholesterol content or in the phospholipid composition of the membrane could trigger sharp changes in “cholesterol accessibility” at the membrane surface. The Heuck lab's pioneer work with Perfringolysin O (PFO) has shown that it is a good reporter of cholesterol exposure at the membrane surface. In the work published this week in the Springer Nature journal Scientific Reports, the Heuck lab developed a non-lytic PFO derivative and used it to study cholesterol accessibility on live cells. They identified modifications that increased or decreased the affinity of PFO for accessible cholesterol. Using these PFO-based biosensors they found that cholesterol accessibility at the plasma membrane of live cells was maintained constant when the overall cholesterol concentration was varied. These findings reveal important insights into the mechanism of PFO membrane-recognition and on engineered non-lytic PFO derivatives to study cholesterol accessibility on live cells. Although dragons are exciting, they are dangerous and expensive to house in a laboratory setting. Therefore, to investigate the genetic and molecular mechanisms underlying various (dragon) phenotypes, Biochem 390G students breed research-tractable cousins of dragons, called drakes, in the interactive, computer-based gaming environment of Geniverse. Developed by the non-profit Concord Consortium, Geniverse allows students to conduct drake breeding experiments, analyze the data, and propose hypotheses to explain the results. A Gene-to-Protein Genie illustrates the transcription of DNA and translation of RNA for relevant genes. Overall, the course spans fundamental Mendelian genetics, epigenetics, genetic engineering, and genome editing. Additionally, students in an Honors section of Biochem 390 utilize bioinformatics tools to build new drake genes, mutant alleles, and phenotypes based on investigations of the scientific literature. Honors students have, for example, created drakes whose genotypes give rise to deafness and dwarfism, cancer and cold tolerance, polydactyly, and the ability to spit spider silk. Emerita Professor Molly Fitzgerald-Hayes and Ludmila Tyler built the course, with input from Dr. Frieda Reichsman of The Concord Consortium. Biochem 390G(HH) is taught by Dr. Tyler and was offered for the second time this spring. This summer, Dr. Tyler presented a poster on students’ work and learning gains at the Plant Biology 2017 conference in Honolulu, Hawaii. Literature on team-based learning emphasizes the importance of team composition and team design and it recommends that instructors organize teams to ensure diversity of team members for optimal team performance. But does the method of team formation actually impact student performance? Sarah Pociask and Mei-Yau Shih of the Institute for Teaching Excellence and Faculty Development, and David Gross from UMass Biochemistry and Molecular Biology, found that teams designed by the course instructor were more diverse, but that students in these teams performed no better than their peers in self-selected or randomly assigned teams. For the second consecutive summer, BMB faculty members Becky Miller and Ludmila Tyler led a week-long course, Investigating Genetic Engineering and Genetically Modified Organisms (GMOs), in the BMB teaching labs. The course is offered through the UMass Summer Pre-College Program, which gives high school students the opportunity to join faculty in exploring a topic of mutual interest in a college setting. This year, twenty-four high school students, most from around New England, participated in the Genetic Engineering laboratory experience. One student was supported by a partial scholarship from the BMB Department. During the course, students learned techniques such as DNA extraction, cloning, bacterial transformation, agarose gel electrophoresis, and PCR. The students performed experiments to determine the presence of transgenes in different foods, discussed the role of GMOs in research and agriculture, and finished the week with a presentation of their findings. Having been impressed with the participants’ preparation, engagement, and curiosity, Dr. Miller and Dr. Tyler are looking forward to offering the course again in the summer of 2018. Elizabeth Vierling and colleagues, in a new publication in The Plant Cell, have discovered an important mechanism that plants require in order to recover from heat stress. High temperature damage to crops is increasing, and understanding mechanisms of heat tolerance is key to ultimately preventing such damage. The new research shows that rapid recovery of protein synthesis after stress is critical, as a delay of even a few hours can compromise plant survival. The work also shows the importance of collaborative research, as Vierling worked with both Chinese and Indian scientists in the study. 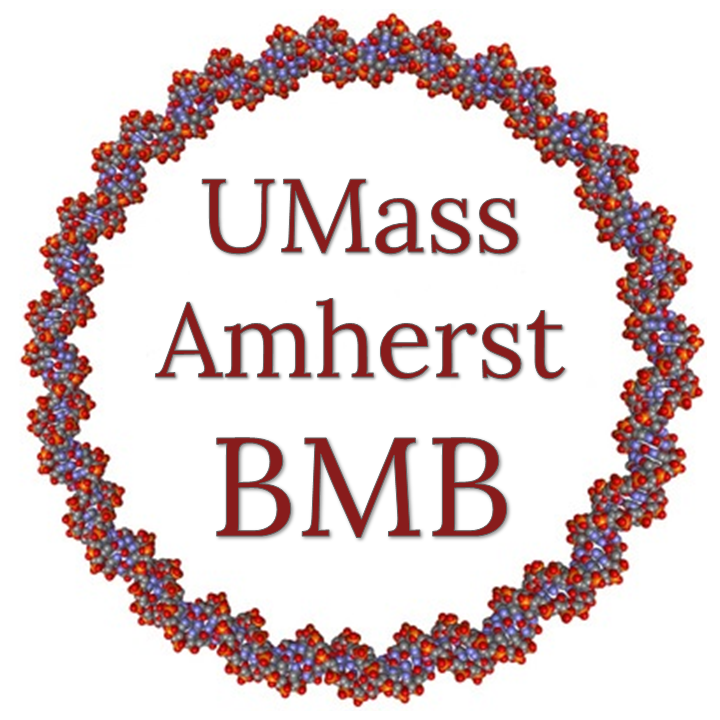 Two rising high school sophomores from Holyoke interned in the BMB teaching labs from July 10th through August 3rd, 2017. The students were placed according to interest in partnership with the Girls Inc. of Holyoke Eureka! program and were paid through the Massachusetts Life Sciences Center High School Apprenticeship Challenge. Students assisted with lab maintenance duties and learned laboratory skills like DNA extraction, PCR, gel electrophoresis, restriction digestion, cell culture, microscopy, and protein expression. They also toured on-campus greenhouses, research laboratories, and natural history collections. Girls Inc. is a national initiative focusing on girls’ development in STEM, leadership and critical thinking, health and wellness, literacy and academic success. Thank you, Mya and Maddy, for all the ways you’ve supported the department this summer! Alice Cheung and Hen-Ming Wu were awarded a combined $1.35 million from the National Science Foundation's Division of Integrative and Organismal Systems and Division of Molecular and Cellular Biosciences to support their continued work in plant male-female interactions and the fundamental mechanisms in plant signal transduction pathways. Li-Jun Ma, an expert in fungal comparative genomics, has received a five-year, $880,000 National Science Foundation Faculty Early Career Development (CAREER) grant to continue her research on pathogenic fungi. The Fusarium oxysporum fungus causes wilt in plant species, costing farmers billions of dollars in losses worldwide each year. The fungus can remain viable for 30 or 40 years, and at present “there really is no way to control it,” Ma says. By advancing understanding of the molecular mechanism of fungal pathogenesis, she hopes to increase ways to develop disease-resistant crops. Robert Yvon, a BMB major working in Dr. Cheung's lab, was chosen as one of ASPB's Summer Undergraduate Research Fellows (SURF). This program funds promising undergraduate students so they can conduct research in plant biology during the early part of their college careers over the course of 10 consecutive weeks. This year’s SURF recipients will present their research at Plant Biology 2018. Congratulations! In a recent paper in the Journal of Biological Chemistry, Associate Professor Peter Chien and graduate student Kamal Joshi explain new details of how cells get rid of proteins when they are no longer needed.